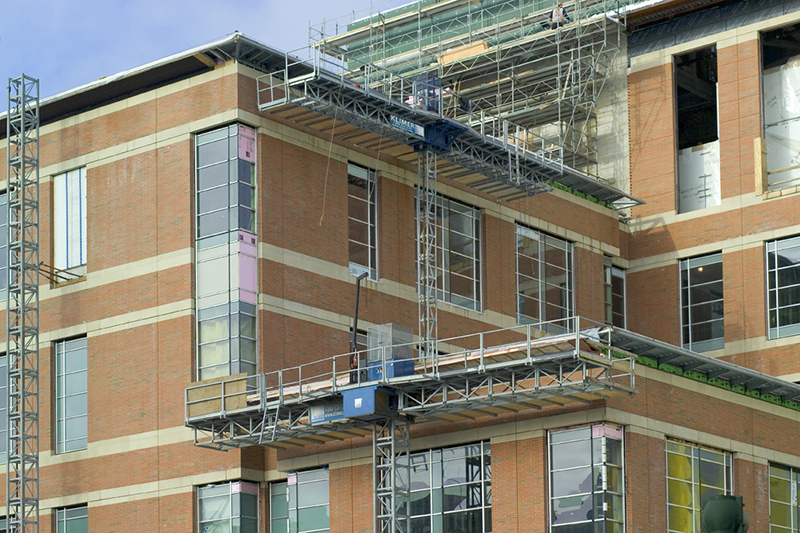 The heavy-duty mast-climbing work platform system designed to reduce project costs. Klimer’s KPM-8 mast climber is the ultimate choice for masonry and concrete restoration contractors. 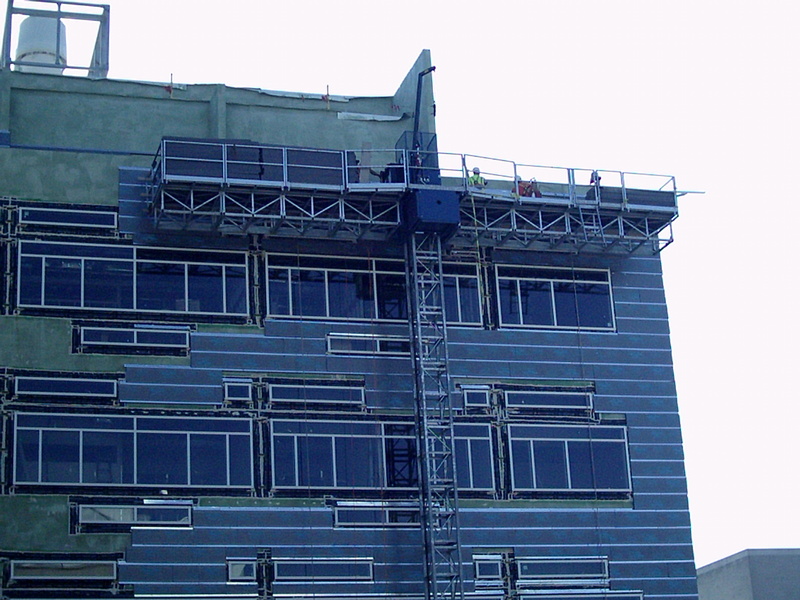 It provides glazing, stone, siding, EIFS, drywall and mechanical contractors access solutions that consistently save time and money while providing a safe, efficient work platform for the highest productivity. Rapid on-site assembly, fast travel speeds, self-contained power supply and outstanding accessories make this exciting mast climber a winner! KLIMERLITE was introduced in January, 2005 at World of Concrete in Las Vegas, Nevada. The medium to light-duty KLIMERLITE is perfect for all types of restoration. 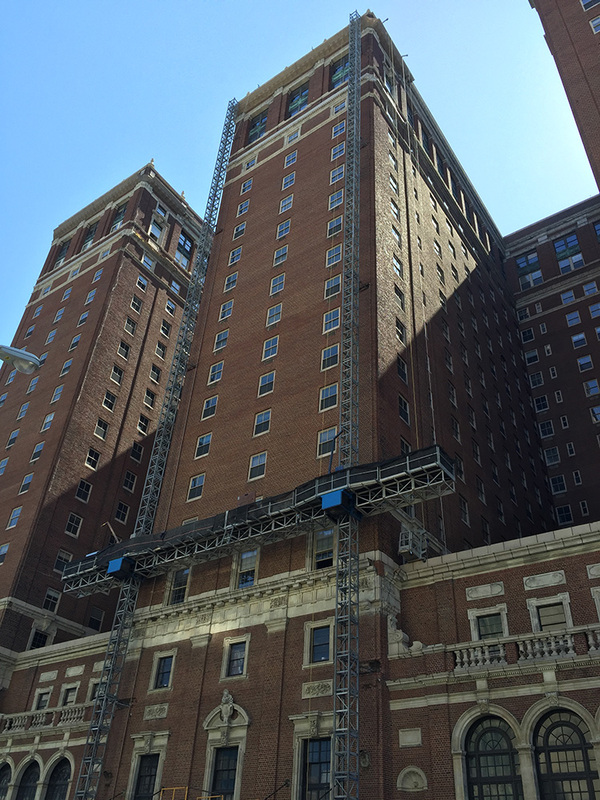 It provides masonry, concrete, glazing, EIFS, waterproofing, caulking and architectural surface repair contractors equivalent benefits to the KPM-8 in a lighter-duty work platform. This system is compact and totally unified. It is small enough to fit through standard doors yet has a high free-standing height! The KLIMERLITE has no loose components. Mast bolt assemblies are permanently attached to mast sections and quick-attach pins are tethered to the platform deck sections. Klimer’s KPM-8 mast climber may be twinned to achieve platforms up to 141′ (42.98 m) long, allowing decks to span from pier to pier and providing full access to the work surface. Industry-leading design dramatically increases production over other types of access. Increase safety, efficiency and profits on your next bridge pier restoration, cable-stayed bridge, dam or utility project. Multiple crews work effectively from one access solution – maximizing time, reducing schedule challenges and increasing profits. Klimer’s heavy-duty KPM-8 boasts fast travel speeds of up to 30′ (9.14 m) per minute and heavy-duty capacities keep trades, tools and material at optimal working height. Savings on challenging bridge work are realized quickly with fewer trips. Klimer’s tie-in design allows platforms to be positioned back from the pier facade for uninterrupted access to the facade. Gas-powered engines eliminate the hazard of hanging cables and increase site organization and containment. Work such as concrete chipping, forming, pouring, drilling of anchors and concrete replacement is performed directly from the work platform, at optimal working height. Klimer’s versatile design allows platforms to be twinned at lengths up to 141′ (42.98 m) providing access from pier to pier. Enjoy increased access to work area and exposure to facade. Klimer’s pedestal base can be engineered to fit into tight or limited spaces and may be customized for specific conditions. Our engineering, drafting and consulting services deliver superior access and ensure superior profitability on your next bridge, infrastructure or heavy civil project. 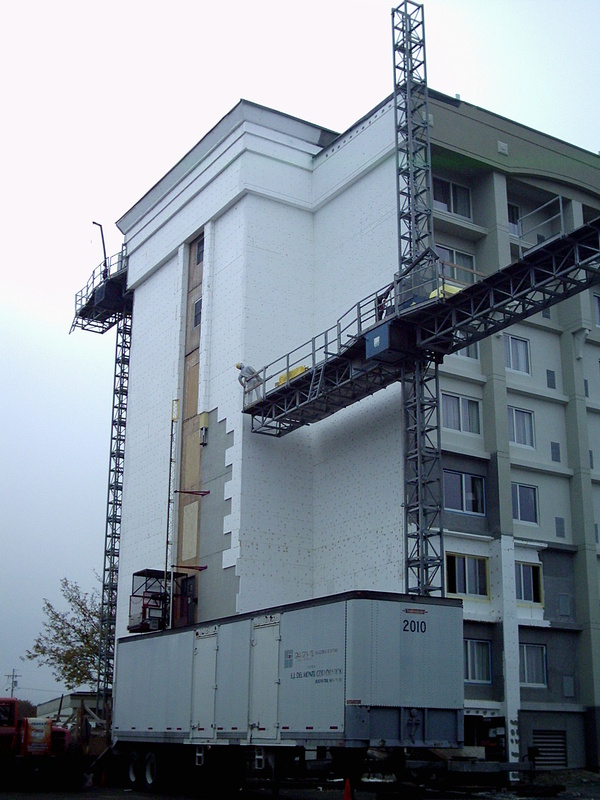 Fewest tie-ins and highest freestanding capability help reduce labour costs and preserve building facades. Swing stage and scaffold is no match for Klimer’s heavy capacity for removing large volumes of material. 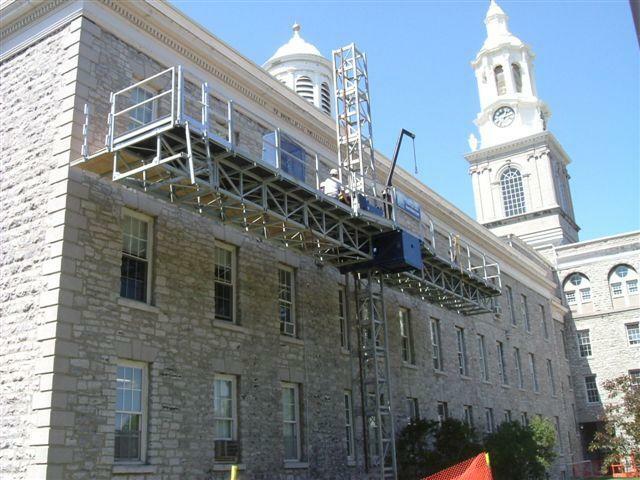 Restoration contractors searching for an all-in-one solution turn to Klimer mast-climbing work platforms where the combination of brute strength, fast travel speeds and unmatched freestanding capabilities deliver on all of your access needs. The scope of work on restoration projects often calls for the heavy capacities that our KPM-8 mast-climber delivers – from 11,500 lbs (5,227 kg) on a single mast up to 26,000 lbs (11,818 kg) on a twin mast. The KPM-8’s work platform is easily adjusted to allow positioning of man and material at optimum height for improved productivity. With variable speeds of up to 39′ (11.89 m) per minute, removal of debris is fast and efficient with our medium- to light-duty KlimerLite mast climber. Restoration may be completed by a variety of trades including masons, concrete, stone, weatherproofing, glaziers, EIFS, cladding, balcony repair and others. With our mast-climbing work platform systems, trades work safely and ergonomically – right from the platform. There is minimal disturbance to occupants with all work being performed from the exterior, making for happy tenants and clients!